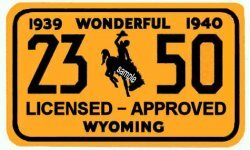 1939-1940 Wyoming Inspection Registration sticker - $20.00 : Bob Hoyts Classic Inspection Stickers, Add a Final Touch to your Restoration! This 1939 1940 two year Wyoming REGISTRATION/Inspection sticker was neccessary to show that the registration was paid. It also had to be checked for safety before the sticker was issued. The back has an interesting commercial for Wyoming and Yellowstone park. It was carefully restored and reproduced to completely remain faithful in color and size, front and back, to the original. It has a new modern "Peel and Stick" adhesive which allows you to place it on the inside windshield (passenger side), like the original. We will provide a FREE reproduction sticker in return for any photo you provide, front and back that we do not list.